Eagle Law Offices, P.S. 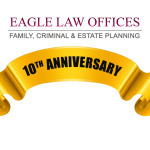 Celebrates 10 Years of Practicing Family Law, Criminal Law & Estate Planning | Eagle Law Offices, P.S. PR Web – Eagle Law Offices, P.S., which has represented hundreds of clients in Family Law, Criminal Law & Estate Planning throughout King, Pierce, Snohomish, and Kitsap counties, reached its 10th successful year in practice this November.